In February 1996, Pacific Gas and Electric Company (PG&E) entered into a voluntary agreement with the California Department of Toxic Substances Control (DTSC)The department within the California Environmental Protection Agency in charge of the regulation of hazardous waste from generation to final disposal. DTSC oversees the investigation and cleanup of hazardous waste sites. to further investigate the nature and extent of contamination resulting from Topock Compressor Station (Station) operations and to clean up related contamination. This agreement, the Corrective Action Consent AgreementA voluntary agreement between a lead agency and responsible party in which the company commits to investigate the nature and extent of contamination at and surrounding a site governed by RCRA, and to take corrective action., and its 2018 amendment, requires PG&E to follow an investigation and cleanup process governed by a federal law known as the Resource Conservation and Recovery Act (RCRA)A 1976 amendment to the first federal solid waste legislation, the Solid Waste Disposal Act of 1965. In RCRA, Congress established initial directives and guidelines for U.S. EPA to regulate and manage solid waste, including hazardous waste. RCRA established a regulatory system to track hazardous substances from the time of generation to final disposal. The law requires safe and secure procedures to be used in treating, transporting, storing and disposing of hazardous wastes. RCRA was designed to prevent new, uncontrolled hazardous waste sites.. In July 2005, PG&E entered into a voluntary Administrative Consent AgreementA legally binding contract between a lead agency and responsible party that serves to resolve an environmental violation through an administrative settlement agreement rather than through a court action. with the U.S. Department of the Interior (DOI)The United States department charged with conservation and development of natural resources. The U.S. Department of the Interior uses sound science to manage and sustain America’s lands, water, wildlife, and energy resources, honors our nation’s responsibilities to tribal nations, and advocates for America’s island communities.. This Consent Agreement ensures compliance with federal requirements as set forth in Comprehensive Environmental, Response, Compensation, and Liability Act (CERCLA). Commonly known as Superfund, this law created a tax on the chemical and petroleum industries and provided broad federal authority to respond directly to releases or threatened releases of hazardous substances that may endanger public health or the environment. CERCLA established prohibitions and requirements concerning closed and abandoned hazardous waste sites; provided for liability of persons responsible for releases of hazardous waste at these sites; and established a trust fund to provide for cleanup when no responsible party could be identified. The law authorizes two kinds of response actions: Short-term removals, where actions may be taken to address releases or threatened releases requiring prompt response. Long-term remedial response actions, that permanently and significantly reduce the dangers associated with releases or threats of releases of hazardous substances that are serious, but not immediately life threatening.PG&E and the DOI executed a Remedial Design/Remedial Action Consent DecreeAn agreement between a lead agency and responsible party in which the responsible party commits to investigate the nature and extent of contamination at and surrounding a site governed by CERCLA, and related remedial actions addressing contamination, and to take corrective action. under CERCLA in 2012, which was lodged with the U.S. District Court for the Central District of California in January 2013, and became effective upon approval by the court in November 2013. The terms of the Administrative Consent Agreement remain in effect for response actions associated with releases of hazardous substances at or from the Station other than the remedial action addressing contaminated groundwaterWater beneath the Earth’s surface that flows through soil and rock openings (aquifers)..
PG&E agreed to conduct RCRA Facility Investigation /Remedial Investigation (RFI/RI)An investigation that occurs in the corrective action process following a Facility Assessment under RCRA and/or a Site Inspection under CERCLA. It is an in-depth study designed to gather data needed to determine the nature and extent of contamination at a site. activities to determine the extent of contamination and potential impacts to human health and the environment, and to gather information to support the evaluation and selection of remedies to address the contamination as necessary. RFI/RI data collection activities started in 1996. The Groundwater Monitoring Program and other field investigations have contributed to the RFI/RI body of data. To view the most recent groundwater plumeA body of contaminated groundwater. The movement of a groundwater plume can be influenced by such factors as local groundwater flow patterns, the character of the aquifer in which the groundwater is contained, and the density of contaminants. maps, based on quarterly groundwater data, please click on figures below. Since some of the property affected by operations at the Station is owned and managed by the federal government, the DOI is overseeing remedial actions pursuant to CERCLA. Therefore, the RFI/RI reports have been prepared to satisfy both RCRA (as managed by DTSC) and CERCLA requirements. There have been several versions of the RFI/RI report. The first draft report was submitted in April 2000 and the second in February 2004. The third draft submitted in February 2005 included the RFI/RI data collected from 1996 through June 2004. The Revised Final Volume 1 Report, Site Background and History, was approved by DTSC and DOI in August 2007. An addendum to the Volume 1 Report was submitted to the agencies on March 26, 2013. Comments were addressed, and the revised final Addendum was submitted on May 30, 2014. The Final Volume 2 Report, Hydrogeological Characterization and Results of Groundwater and Surface Water Investigation, was approved by DTSC and DOI in February 2009. Volume 2 addressed potential groundwater impacts associated with the past discharge of wastewater from the Station to Bat Cave Wash (designated as Solid Waste Management Unit [SWMU]An area outside of the source remediation site that is being evaluated and may be contaminated due to the management of solid wastes without proper protective practices in place. The SWMU is subject to the overall site’s environmental investigation to determine if it will also need to be remediated. 1/Area of Concern [AOC]Areas outside of the source remediation site that are being evaluated and may be contaminated due to past practices and/or proximity to the source site. These areas are subject to the overall site’s environmental investigation to determine if they will also need to be remediated. 1) and injection well PGE 8 (designated as SWMU 2). Pore water and river sediment characterization was also included. The Volume 2 Addendum was approved in June 2009 by DTSC and DOI, and includes supplemental data and information collected after the data cutoff period for Volume 2. To provide additional information to support the groundwater remedy design, PG&E conducted additional groundwater characterization in an area located east/southeast of the Station, known as the East Ravine area. 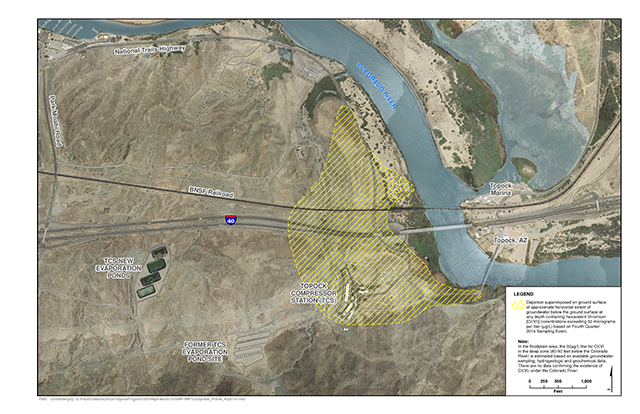 Previous investigation of this area concluded that hexavalent chromium had affected bedrock at the Topock Project Site (Site). Well installation and additional investigations in the East Ravine were completed per the approved Revised Addendum to the Revised Work Plan for East Ravine Groundwater Investigation dated July 2010. Results of the East Ravine investigation can be found as Appendix A of the Final Groundwater Corrective Measures Study/Feasibility Study Report for SWMU 1/AOC 1 and AOC 10 Chromium in Groundwater, and in the Final (100%) Design Report. A surface geophysical survey and excavation were conducted in April and July 2013 to locate an old well in Bat Cave Wash several feet below the ground. The well was located, and in September 2013, modifications were made to bring the well casing up to the existing gound surface, and soil samples were collected near the wellhead. Archeological monitoring and biological monitoring were conducted during all stages of the field work. This well is referred to as TCS Well No. 4 (TCS-4). PG&E submitted a final Decommissioning Plan on December 15, 2015. Decommissioning activities began on February 24, 2016 and were completed on March 9, 2016. A Decommissioning Report was submitted to agencies on June 7, 2016. To guide decisions based on potential risks to human and ecological health at the Site, PG&E submitted a comprehensive Human Health and Ecological Risk Assessment Work Plan for groundwater in August 2008 and an Addendum in February 2009. A Final Risk Assessment titled Human and Ecological Risk Assessment of Groundwater Impacted by Activities at SWMU 1/AOC 1 and SWMU 2 was submitted to the agencies in December 2009. The risk assessment provides information about potential human health threats and ecological risks posed by affected groundwater, and assists risk management decision making. The Final Groundwater Risk Assessment was approved by the agencies in December 2009. PG&E implemented both a floodplain reductive zone In Situ Pilot Test (ISPT), as well as an upland reductive zone ISPT. The purpose of these ISPTs was to evaluate the efficacy of using food-grade reagent mixture to remove hexavalent chromium from groundwater using chemical reduction Typical chemical reduction/oxidation process (sometimes referred to as Redox) reactions chemically convert hazardous contaminants to nonhazardous or less toxic compounds that are more stable, less mobile, and/or inert. Redox reactions involve the transfer of electrons from one compound to another. Specifically, one reactant is oxidized (loses electrons) and one is reduced (gains electrons).to form stable, insoluble trivalent chromium. The floodplain ISPT consisted of injection of a reagent mixture into a well cluster during May 2006 through July 2007 and monitoring the results in nearby wells. Post-test monitoring of the wells in the floodplain ISPT demonstrates that hexavalent chromium continues to be reduced. The floodplain ISPT monitoring was completed in June 2014. The upland ISPT consisted of the recirculation of the reagent mixture between two recirculation wells from March 2 through November 1, 2008, and monitoring the results in nearby wells. Post-test monitoring of the wells in the upland ISPT indicates that hexavalent chromium continues to be treated in areas where total organic carbon was greatest and strong reducing conditions were established. Additionally, byproducts (such as arsenic and manganese) have either returned to baseline levels or are generally declining, except in locations of temporary increases due to the anaerobic dissolution of arsenic and manganese-bearing minerals. The upland ISPT monitoring was completed in June 2014.